Confederate Sack Coats Made in USA. Artillery, Infantry, North Carolina, Old Dominion Rifles. The Sack Coat is a loose fitting jacket that extends to below the hip. The lined sack coat is the Civil War period correct standard, but unlined versions existed as well. All Sack Coats with the exception of STANDARD Colors, Styles, and Sizes as listed below are custom made specifically for you and are subject to a restocking fee. STANDARD SACK COATS: Sizes 38-48 Regular Length; Enlisted; Unlined; Untrimmed; 7-Button Front CS Sack Coat in Medium Gray wool, or 4-Button Front US Sack Coat in Navy Blue Wool; All Budget-line Sack Coats. This NEW, NEVER WORN SIZE 46 CS Sack Coat is made of 15 oz. MEDIUM GRAY Wool and is untrimmed and unlined. It has a 7-button front of CSA buttons and HAND DONE BUTTON HOLES. There is one inside pocket. Only 1 Available. SOLD AS IS. All sales FINAL. This C&C Sutlery CS Sack Coat is a plain, untrimmed, unlined Sack Coat. It has a 7-button front of CSA or Block "A", "C", or "I" buttons. There is one inside pocket. The coat is available in several different wool colors and in a 6, 7, 8, or 9 button front. Click on the picture for more images. This sack coat when made in Medium Gray is a stock item and not subject to a 20% restocking fee. This C&C Sutlery CS Sack Coat is a plain, untrimmed, Lined Sack Coat. It has a 7-button front of CSA or Block "A", "C", or "I" buttons. The coat is lined in a cotton muslin lining and there is one inside pocket. The coat is available in several different wool colors and in a 6, 7, 8, or 9 button front. Homespun Lining is an available option. Click on the picture for more images. 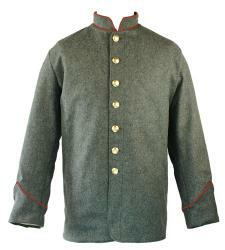 This C&C Sutlery Artillery CS Sack Coat has a solid artillery red collar and cuff, a 7-button front of CSA or Block "A" buttons, and is unlined with one inside pocket. The coat is available in several different wool colors. Click on the picture for more images. + Muslin or Home Spun lining. 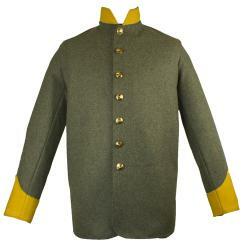 This C&C Sutlery Cavalry CS Sack Coat has a solid cavalry yellow collar and cuff, a 7-button front of CSA or Block "C" buttons, and is unlined with one inside pocket. The coat is available in several different wool colors. Click on the picture for more images. 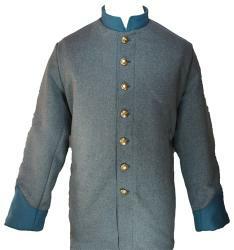 This C&C Sutlery Infantry CS Sack Coat has a solid infantry blue collar and cuff, a 7-button front of CSA or Block "I" buttons, and is unlined with one inside pocket. The coat is available in several different wool colors. Click on the picture for more images. This C&C Sutlery CS Sack Coat has Branch Of Service color solid trim on the collar and cuff, a 7-button front of CSA or Block "A", "C", or "I" buttons, and is unlined with one inside pocket. The coat is available in several different wool colors. Click on the picture for more images. This C&C Sutlery Artillery CS Sack Coat has artillery red Piping Trim on the collar and cuff, a 7-button front of CSA or Block "A" buttons, and is unlined with one inside pocket. The coat is available in several different wool colors. Click on the picture for more images. 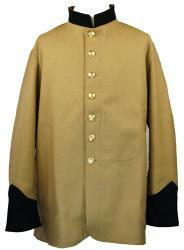 This C&C Sutlery Cavalry CS Sack Coat has cavalry yellow Piping Trim on the collar and cuff, a 7-button front of CSA or Block "C" buttons, and is unlined with one inside pocket. The coat is available in several different wool colors. Click on the picture for more images. 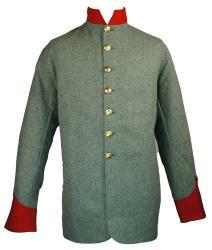 This C&C Sutlery Infantry CS Sack Coat has infantry blue Piping Trim on the collar and cuff, a 7-button front of CSA or Block "I" buttons, and is unlined with one inside pocket. The coat is available in several different wool colors. Click on the picture for more images. This C&C Sutlery CS Sack Coat has Branch Of Service color piping trim on the collar and cuff, a 7-button front of CSA or Block "A", "C", or "I" buttons, and is unlined with one inside pocket. The coat is available in several different wool colors. Click on the picture for more images. 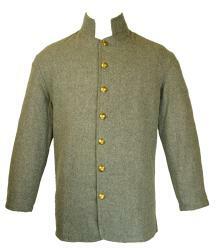 The North Carolina Sack Coat was used by the volunteers and state troops of the state per the Regulations for the Uniform Dress and Equipment, of the Volunteers and State Troops of North Carolina. 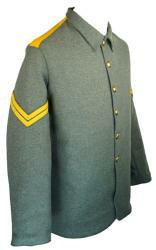 This C&C Sutlery North Carolina Sack Coat has distinguishing sewn down shoulder epaulettes indicating branch of service and a lay down collar. It is a 6 button front with CSA or Block "A", "C", or "I" buttons, has 2 inside pockets, and is lined in a cotton lining. The coat is available in several different wool colors. An optional Homespun Lining is available for an additional cost. The coat is pictures with optional chevrons. This C&C Sutlery Old Dominion Rifles Sack Coat is is made of medium gray wool, has a straight sleeve, is lined in muslin lining, and has a 9 button front of Virginia State buttons. The front and buttoned epaulettes are trimmed in black piping. The collar and shoulder rolls are solid black. The Trefoil sleeve braid is black. 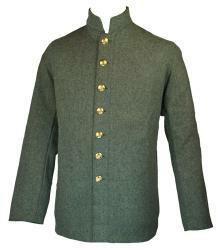 Per the original constitution, December 6, 1860, of the Old Dominion Rifles the jacket was made of Cadet gray wool and the trim, piping and braid were green. 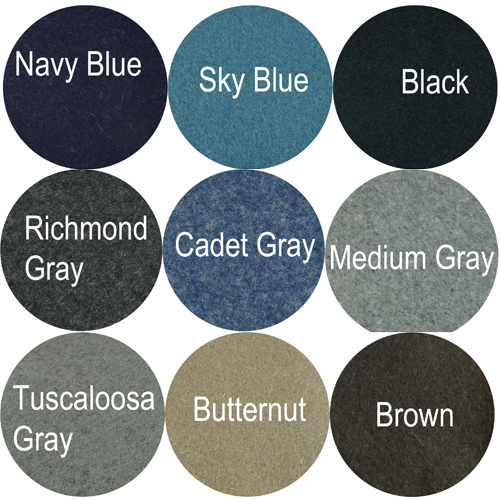 These colors are available as options for this coat. Click on the picture for more images. Proudly MADE IN USA in the Great State of Idaho. The militia company known as the "Old Dominion Rifles" was organized in December 1860 and captained by Montgomery Dent Corse. This militia company became Company H of the 17th Virginia Infantry. This sack coat is shown in Even More Confederate Faces by William A. Turner, copyright 1983, page 161. 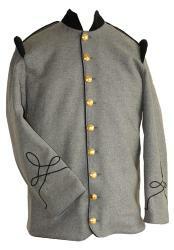 A gray wool covered militia shako is the correct headware for this sack coat. This C&C Sutlery Civilian Sack Coat is a style typical of the common man, farmer or shopkeeper. This coat was brought from home by the soldier and worn instead of a standard issue sack coat. 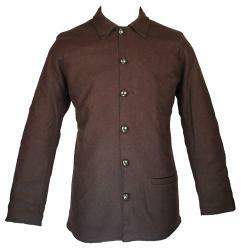 The civilian sack coat is a 5 piece construction, with a 6 button front and woven brown leather domed buttons, with a lay down collar, has one front outside pocket, and is lined in a cotton muslin lining. This Coat is custom made specifically for you and is subject to a MINIMUM 20% restocking fee. Please allow AT MINIMUM 4-6 weeks for delivery. Click to read our RETURN and EXCHANGE Policy. All of our sack coats can be customized to meet your needs. In many cases, we can duplicate a sack coat from a picture. If the options below don't meet your needs, call us to discuss your specific customization.